Me: *Looks over* Oh, uh, yeah? You guys: 4 questions: What are you doing, why are you driving at the age of 13, where are you flying to, and who are you saying that to? Me: IT'S AN AUSTIN AND ALLY SONG!!!!! HEY GUYS!!! What's up!? 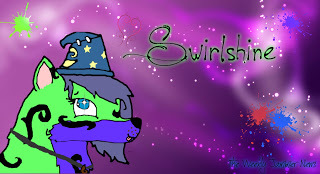 I know what you're thinking: "FINALLY, SWIRL'S BACK FOR ANOTHER POST!" And I'm sorry about my lack of, uh, being here. I had a long week, which consisted of running (aka "conditioning", haha, even though it's just running for no reason), studying, sleeping, people getting sick all around me (and me trying not to get the germs), and a creepy-ish girl in my 3rd period. But, finally, I'm back!!! Super sorry once again! Man, I wish school wasn't so time-consuming! It makes me SOO tired! I literally felt tired all week. Luckily, though, we didn't have basketball practice of Friday! UNluckily, we had to run because of disrespect and something that happened on a bus that I DIDN'T EVEN RIDE. But that's enough of my...er...DELIGHTFUL week. I'm here for a REAL post, not to complain about school! So let's get started on that! On the post...not the complaining about-well, you already got it, I bet, so...uh...never mind. XD! AHHHHHHHHHHHH, I'M SORRY, I JUST WANT TO LOOK AT IT FOREVER!!!!!!!!!! But it took me HOURS, believe it or not, and I'm just proud of myself. I'd never really drawn anything like this with a drawing tablet yet. All I've done is trace pictures. So what do you guys think? Is it a good first-ever tablet drawing? Also, someone PLEASE help me think of a better look for this deer that includes the Feather Necklace. Okay, so, a week (or something like that) ago, Kraft sent me this really cool Masterpiece she made of Blogger Portals (yes, capitalized. They are special things. 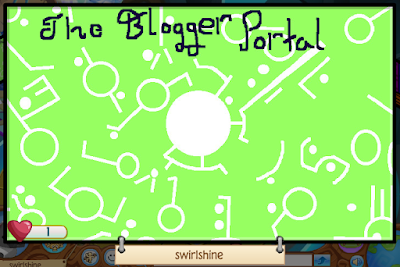 ), and I loved it so much that I decided to make my own version of a Blogger Portal Masterpiece! I thought AJHQ wouldn't approve it, since I wrote "The Blogger Portal" across the top of it, but turns out they didn't mind! 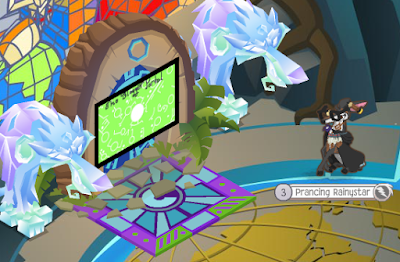 So now, it's in my Sir Gilbert's Palace den, which has now been turned into a Swirlshine Palace, XD, in the very bottom little...chamber-thing. And here's how it looks in my den! Now come to my den and like it, because I'm the only one who's done so so far, XDD! Wow. Okay...so I thought there'd be-WAIT!!! WAIT WAIT WAIT!!!!! I know EXACTLY what I should mention next! Okay, so, my sister watches the daily Bepper, Julian2, Aparri, and sometimes, Wisteriamoon, videos...uh...daily. She told me yesterday: "Guess what? 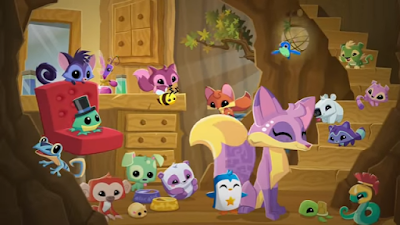 Animal Jam apparently sent all the famous jammers a note that said they'd be adding 500 more den slots for members in one of the next updates!" And that's when I started screaming and jumping around and fangirling. No kidding. Anyway, this is HUGE!! Not just 500 den spaces, 500 MORE!! That means 1,000 den slots in total! If we got that, I'd never have a full inventory problem again! I only have 2 more den spaces, as of right now, but 500 MORE!? I could get every item I've ever wanted on AJ! And you know what that means: MORE MASTERPIECES, TOO! Sadly, it's only for members, but I suppose that more den slots for people with more items to buy makes sense. Although I wonder...1,000 den slots? Wouldn't that make dens way too laggy? They'd have to keep animated item-like those Candy Making Machines- making to a minimum. I thought the whole reason AJ doesn't have infinite den slots (like Club Penguin, apparently) is because it'd make the dens way too laggy! But hey, I'm not gonna argue with more space! I just hope this doesn't turn out to be a false rumor, because I'm looking forward to the next few updates now! COME ON THURSDAY, COME ON!!! Does AJ Have A New Mascot!? Oh my gosh, I spelled compadres right on my first try! OH YEAH!!!! 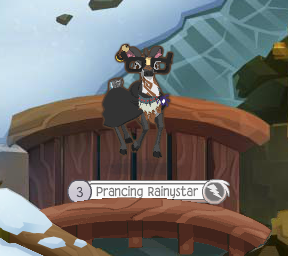 Man, it's been quite a while since I've actually posted about Animal Jam, huh? Or posted AT ALL, other than the occasional (I SPELLED THAT WORD RIGHT TOO YAS!!!) reminder about JM. Well, to be honest, I wasn't planning on posting today, either. However, something caught my eye while I was listening to a song on YouTube. I noticed a video on the side called "New 2017 Animal Jam Commercial! ", and it was posted on Animal Jam's official YouTube account! So I decided to take a look. It actually wasn't too bad, despite the cheesy lady's voice that might scare children away rather than attract them. But hey, if that's how AJ wants to advertise, that's their business, not mine. Anyway, as I watched the commercial, I took a few screenshots that would make some pretty cute screensavers! Rather cute, if I do say so myself! 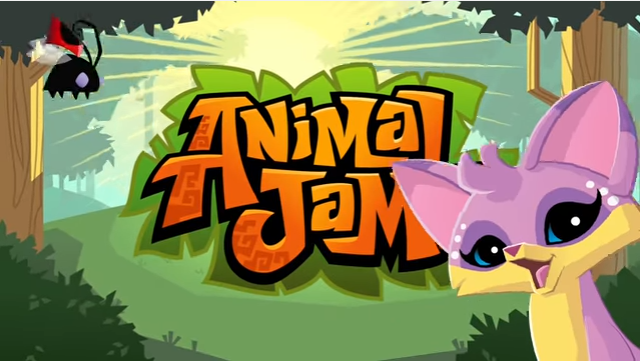 But there's something in common about all these pictures; and no, it's not "they're all about Animal Jam". 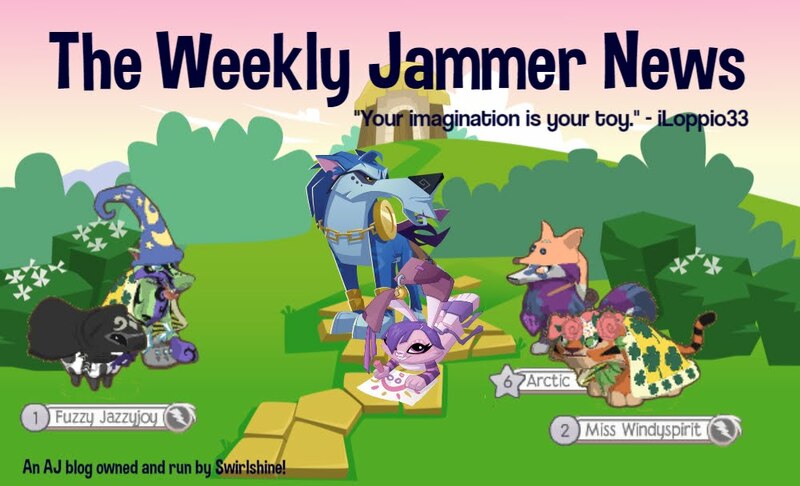 That lavender-and-cream-colored fox, with the gizmo pattern, and a white dot pattern that goes by its unusual eyes, ones that you can't get in AJ. It, or rather, she, is always plastered on the side of the AJ toy den playsets. She's also been included in a special summer home screen background, one that you could only see by clicking an AJ ad. I would show you a pic of it, but...you know...computer issues. And, if you look closely at the fox that comes with the Princess Den playset, you'll notice that the colors match this fox's colors to a tee. The only things it doesn't have are the pattern and the correct eyes/eye color, but I'm sure AJ had their reasons. And now, she's the main animal in this new ad. So, what does this mysterious fox mean? 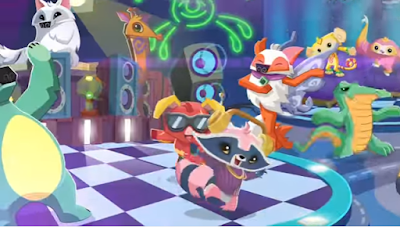 I was thinking that it could be Amelia, the fox Alpha, since her true colors have never been revealed as far as I know, but Amelia wears hoop earrings, and I've never seen this fox with any earrings on. So does this mean that AJ is trying to make this purple fox their new mascot? Now, I'm not saying that this fox will replace the traditional ladybug mascot. I doubt AJHQ would do that. It's too well-known to get rid of now. However, the ladybug IS quite small, and it resembles the pet ladybugs. The fox is a true animal avatar. Well, with a few changes, of course. But we all know AJHQ. If you've ever visited their seasonal dens on the Epic Dens list, you'll see that they LOVE to put unreleased items all over just to make us jealous. Okay, so that last part might not be true, but the first part is. Still, they might have done the same with this fox. Or, maybe they just didn't want anyone to copy it on Animal Jam, for some...odd reason. Now that I think about it, isn't it the same for the ladybug? I don't think you can make a pet ladybug's body shape the correct shape of the mascot one. I'm not exactly sure what this fox is truly meant for, but it's possible that my theory COULD be correct. COULD BE. But this all just might be a coincidence. We won't know for a while, and we might not ever know. Still, it's fun to make up theories! I hope you all enjoyed this post! I must say, I'm quite happy to be beating Julian2 to this! XD! Until next time, remember to PARTY HARD, BE KIND, and JAM ON!!!!!!!!!!! Hey guys, should I clean out the comment section on the JM tab? I only say this because it's gotten so full that there's now this "Load More" button that appears, but when I click it, it says "Loading..." forever and never loads. I WOULD keep all the stories you guys wrote on there, though! See you all hopefully tomorrow. See, THIS is what napping after school does to my game-time. It's up! Hope you enjoy it! i'm hacking this so called swirlshine person. get out now or i'm hacking you all. Okay okay, just kidding! 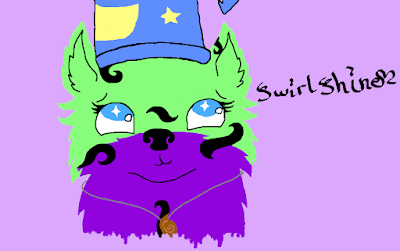 It's just Swirl, and no, I'm not going to hack you. I don't even know how to hack, and if I did, I'd probably be horrible at it. Also, just so you know, I hated typing like that. Not capitalizing the correct things, I mean. It looks SO HORRIBLE! GRRR! You guys: .O.O Chill Swirl, it's just a few lowercase letters! Me: NO!!! NO, IT'S A LOT! SEE? THERE'S 1, 2, 3, 4, 5...5 OR 6!!!! ARGGGGGGGGGGGGG, IT'S KILLING MEEEEE!!!!! You guys: Uh...well...guess we know how to anger Swirl now. XD, okay, so you guys wouldn't really say it like that, but you get the idea. I'm getting VERY tired of school. 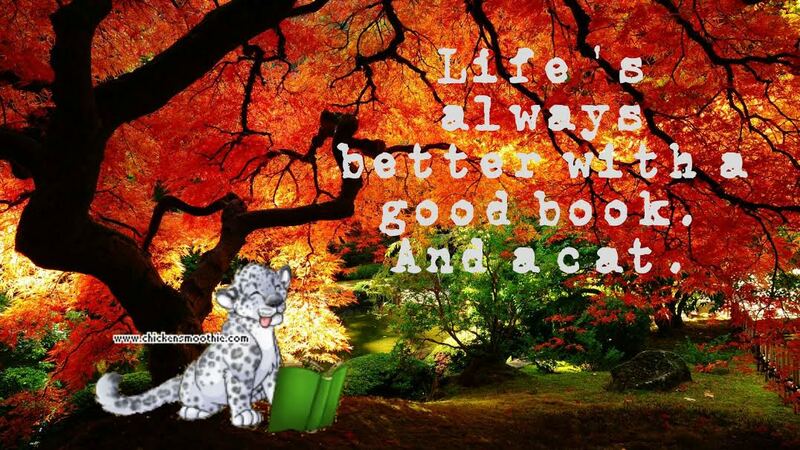 And homework. And staying after school until 6 (we get out at 4) for basketball practice. On the bright side, I've got 2 new friends that I get to be with at lunch...so that's good, right? And hopefully, the teachers will take it easy on us, since we're just coming back and all. That's really all I can think of to look forward to. Anyways, I'll hopefully be posting a new Jamaasian Middle every Saturday from now on! Or at least every weekend. If I can't do it, I'll be sure to tell you all! Alrighty, how about we move on to the next topic? And that topic is...DRUMROLL PLEASE! 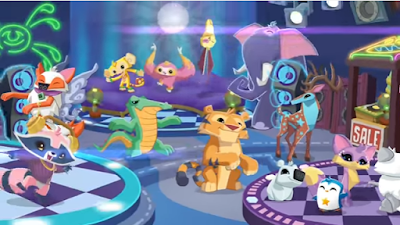 The topic is...ANIMAL JAM TOYS! I had a $25 Walmart gift card, and so did my sis and bro, so we all went to Walmart the other day and bought some things! 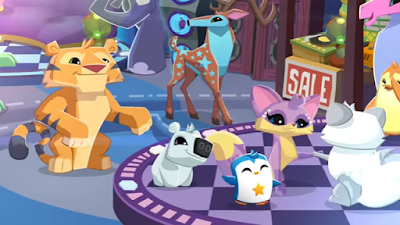 My sis and I bought Animal Jam toys. I picked out 4 Adopt-a-Pet houses, each a different color, the Punk Penguin plushie, and the King Koala plushie! Honestly, I dunno why AJ named them that. The penguin is NOT punk! He's only wearing a tie! Very cute, but not punk. And KING Koala!? IT'S PURPLE AND WEARING A TIARA!! IT'S A GIRL, AJ!!! I'm a fan of alliteration myself, but that one's just wrong. Getting off topic, Swirl! KEEP IT TOGETHER!!!! So I got those, and when I opened them at home, guess which ones I got? And the orange cheetah I've been wanting! TWO DIAMOND PETS IN ONE TRIP TO THE STORE! I ended up getting 6 diamonds and some gems from those codes! I also got a Rare Koala Plushie from the...ahem..."KING" Koala. I tried putting in the code that came with my "Punk" Penguin, but it said I did it wrong! At first I thought that something was a 9, but then I realized it was a 3, and it STILL wouldn't work! Then, it thought I was a hacker robot, and made me do those little "Drag the matching picture" thing, until it finally told me I couldn't type in codes at the moment. Just great. I hope it works today, otherwise, I'm emailing AJHQ. But seriously guys, you should REALLY buy some AJ stuffed animals. THEY'RE SO FUZZY! Seriously! I could feel the fabric for hours! XD! Okay, so, as most of you know, I had to get a new computer. I'm typing on the new one right now! It's up and working pretty well, but some of my saved Masterpieces and files are still stuck in my broken computer. My old bookmarks were on my Chromebook as well. That's how I was able to check all of you guys' blogs every day. The bookmarks reminded me and made me feel like I needed to check all the blogs. Okay, so yes, I could just put the same bookmarks on THIS computer myself, but that would take a long time. Plus, I'm not sure I even remember every single blog I need to bookmark! So I'm gonna wait until my broken computer is taken to the shop, and the data is transferred to my new one. So, if you guys have been wondering why I haven't been commenting on your blogs lately, this is why. I've also been pretty off-track and lazy, so I apologize. If you really need me to check your blog, or a post on it, just tell me in the comments, and I'll gladly check it out! See you all soon! Remember to PARTY HARD, STAY HOPEFUL, and JAM ON, my Swirlies!! Yeah, okay...I'm not doing that again. PS. If anywhere in this post I sounded like I was bragging, I deeply apologize. I didn't intend to. Most of you know that I don't try to brag anyway, though, but I just thought I'd include this, just in case.